President Trump was asked about the UCLA situation before boarding Air Force One ... and praised Chinese President Xi for helping out. "President Xi has been terrific on that subject ... But that was not a good subject. That was not something that should have happened." When asked specifically for his thoughts on the shoplifting allegations, Trump said, "What they did was unfortunate." "You know, you’re talking about very long prison sentences. They [Chinese officials] do not play games." The 3 UCLA basketball players accused of shoplifting in China are finally leaving the country Tuesday -- and flying back to the United States, this according to the Wall Street Journal. 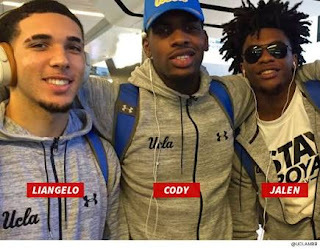 LiAngelo Ball, Jalen Hill and Cody Riley were spotted at the Pudong International Airport in Shanghai early Tuesday -- getting ready to board a Delta plane bound for Los Angeles. The players had been confined to their hotel after officials say they jacked sunglasses from a Louis Vuitton store during the team trip to China. Some of the most powerful people in the world got involved in order to get the players home -- including President Donald Trump and billionaire Alibaba founder Jack Ma.